For many on the Leave side, talk of a referendum on the terms smacks of a stitch-up from an establishment that is out of touch. There’s a taste of this in the logic that a referendum is a bad idea because it encourages the EU27 to offer the UK a bad deal. The reality is that the EU27 have a duty to act in the best interests of the continuing members of the EU. The only time when they would have a duty to take note of the needs of the UK is if we stop Brexit still offers a way to get past “the establishment” to some bright new future. The recent news and rumours around Cambridge Analytica may not help matters. On the Remain side, we are seeing this as further grounds for questioning the vote. But it can also be heard as “the establishment” finding another bizarre story to frustrate Brexit and take away their hope. In party-political terms this is relatively easy for Liberal Democrats because there is such a strong correlation between support for Liberal Democrats and for EU membership. If anything, we need to be careful to keep faith with those who have joined us over our opposition to Brexit. But for Labour it is much more complicated. Many of those who voted Leave out of fear are among their core supporters. Labour can do things to reach these people, but many of these link EU membership and the abandonment they felt under New Labour. Moving too quickly risks taking away not just the bright hopes of Brexit, but also the hopes of people who have put their trust in Jeremy Corbyn. Labour might need to hold fire and wait for more public pressure before switching to supporting a referendum on the terms. Much as I would like to see an immediate exit from Brexit, what this actually points to is continued political chaos, where it is important to stay faithful to the fundamentals for both parties. For Liberal Democrats, internationalism in general, and support for EU membership in particular, are pretty basic. Our vision for improving life for the “left behind” is deeply entwined with our understanding of what EU membership offers. But for Labour, staying with the fundamentals, might well need to be more around their self-image of themselves as the party of the working class. It is taking a while for the spotlight to fall on what the EU has done for workers’ rights, to help economic stability and to support deprived areas, and for people to start realising that the likes of Jacob Rees-Mogg are not be the best allies of those who are struggling. We do need to work together to find a brighter future than Brexit, and present polling shows there is still a long way to go. 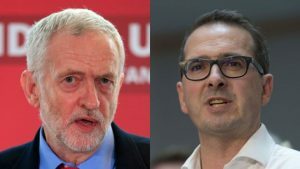 While it is difficult for Labour to be as clear as many of its supporters would like, Liberal Democrats have a role in putting the case, both for EU membership and for its relevance to the “left behind”. That means reaching beyond core Liberal Democrat supporters For the moment, the internal struggles of the other parties seem to be mostly about the chaos of Brexit, and shouldn’t deflect from the primary task of addressing Brexit and the divisions it has exposed.